While watching Gremlins recently (for the first time in ages), I discovered that the film, which originally came out in summer 1984, was re-released in summer 1985. Given that I saw the movie in a theater, this made a little more sense to me than the idea that my father took me to see this movie when I was five years old. But six? Anything goes at six. But I kid. Watching it now, I have no idea why I wasn’t traumatized by the wholesale mayhem and slaughter in this film. An elderly couple get run over by a snowplow (it’s implied they die in the film, but this is ignored when they return in Gremlins 2); another old woman gets blasted out of her house into a garbage can; dogs are threatened with death; a friendly science teacher is (presumably) somehow killed; and in one infamous sequence, a suburban mom turns her kitchen into a Gremlin abattoir – stabbing one with a steak knife, puréeing another in a blender, and bursting another in a microwave. And that’s to say nothing of Stripe’s slow, disgusting disintegration in the sunlight at the end of the movie. But no, no terrified memories of Gremlins like I had of the dead knight in The Neverending Story or Large Marge in Pee-Wee’s Big Adventure. 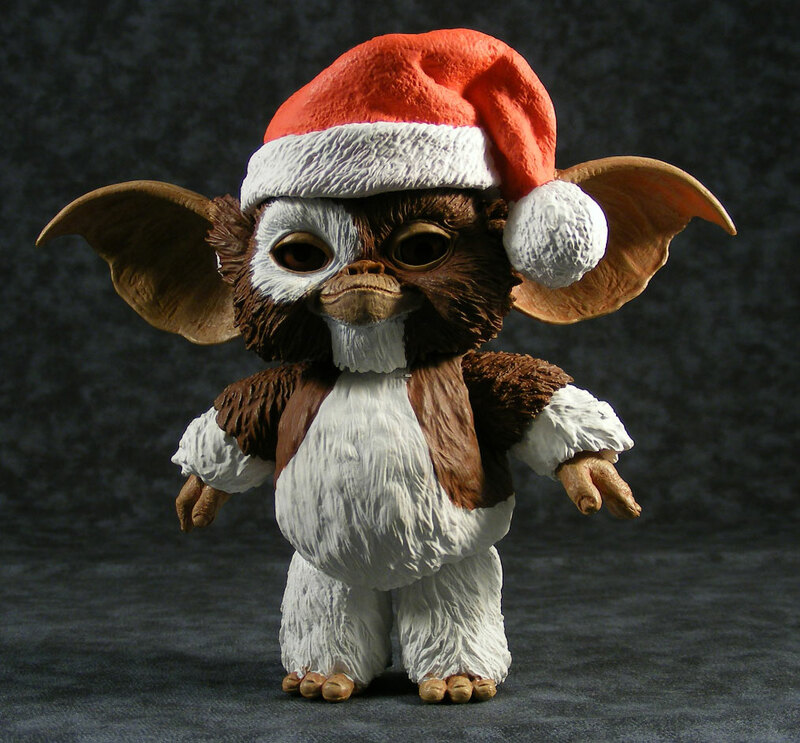 Instead, what I apparently took away from Gremlins was (shockingly) a desire for toys. I had a bendie Stripe (never got the big one, though man, did I want it) and the poseable Gizmo, which I reviewed a while back. I was also more than happy to make an exception for “Santa Gizmo,” a Toys”R”Us exclusive this holiday season. Holiday toys are great because they’re a collection unto themselves – I’ve got figures from toy lines I would never collect (like JAKKS’ Smurfs line) solely because they released a holiday exclusive. 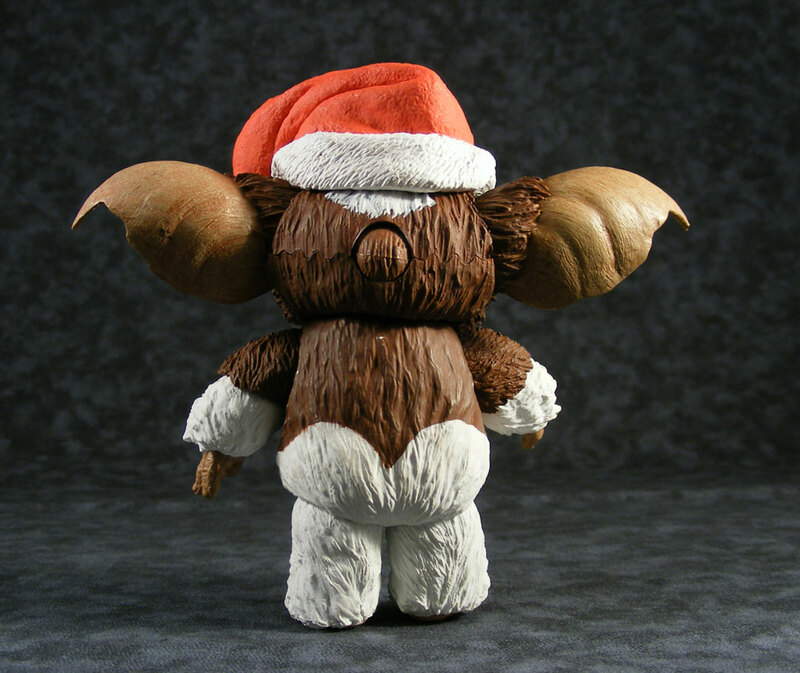 Santa Gizmo is one of the better holiday exclusives for a few reasons. 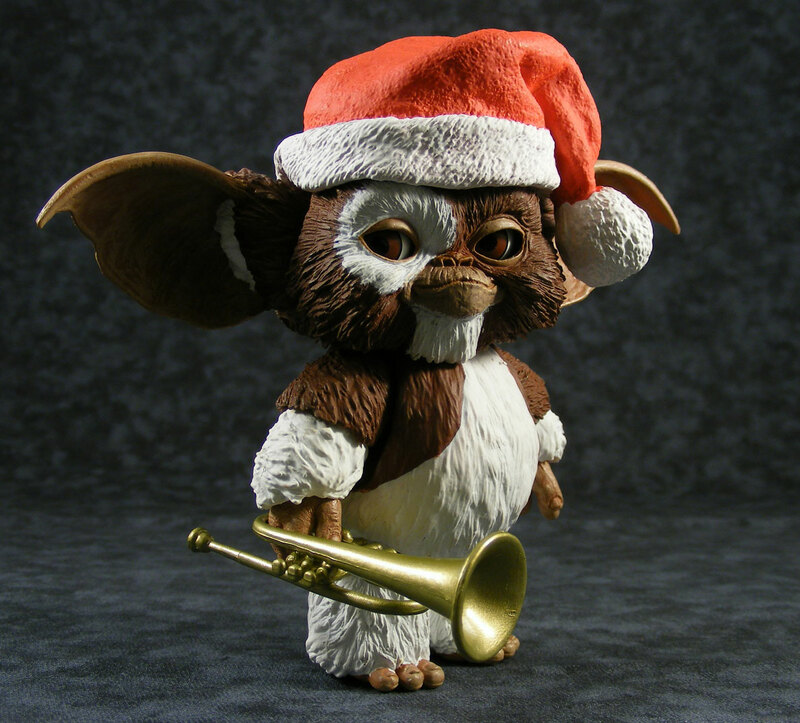 Despite its summer release, Gremlins takes place at Christmas and can be considered a Christmas movie, so this figure is in the spirit of the film. 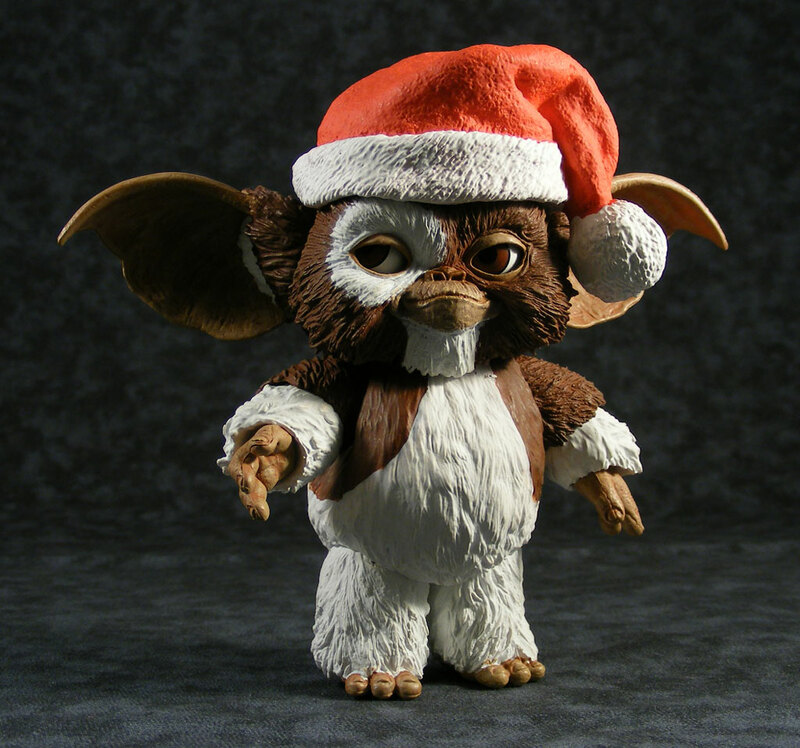 Also, it’s somewhat screen-accurate, because at one point in the movie Billy Peltzer does put a Santa cap on Gizmo (though it’s a human-sized one that’s much too big for him). I don’t think the idea was to create a figure of Gizmo from that specific scene as it was just to create a fun holiday treat. 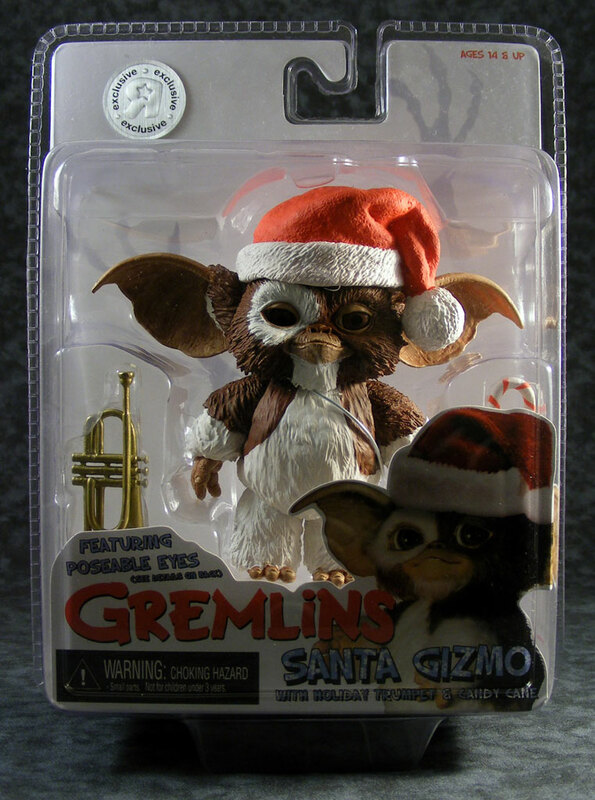 The packaging also has a photo of the puppet Gizmo wearing an in-scale Santa hat, though whether that’s some sort of marketing shot from the 1980s or a new shot someone cooked up for this figure’s release, I don’t know. I don’t own the regular Gizmo, but this figure seems to sport most (if not all) of the same sculpt, which was done by Jason Frailey (who’s done a few “sculptor commentaries” here on the site). The hat is obviously new. The sculpt is excellent – highly-detailed and far more accurate to the film than LJN’s bug-eyed effort (I do love that toy, but it’s not as well-sculpted as this one). The paint work is great as well. There’s no wash on the white areas, but that was probably a good decision as it would have made him look filthy. The dry brush work on the ears and around the mouth are well done. The articulation is relatively minimal, but that’s hardly surprising on a figure like this. The head seems to be somewhat ball-jointed, but it’s heavily restricted by the body shape. The shoulders are ball joints, as are, adorably, the ears. The elbows have some sort of movement (I think it’s a ball-hinge), while the hands appear to be ball-and-socket. The hips have some movement, but it’s so limited I have no idea what it is. Still, the effort is there, and as an articulation junkie I’m satisfied with what Gizmo has here. And then there are the eyes. When you move the trackball on the back of the figure’s head, the eyes move. They can move in pretty much any direction, and the eyes are loose in the sockets so as you’re moving them around, Gizmo will often look like he has a lazy eye or is making some otherwise very goofy faces. However, it’s easy to get the eyes to settle into a number of very cute expressions, from sly to adoring to happy. Kudos to NECA for developing and implementing this innovative system, which adds a ton of play value to an already-fun toy. 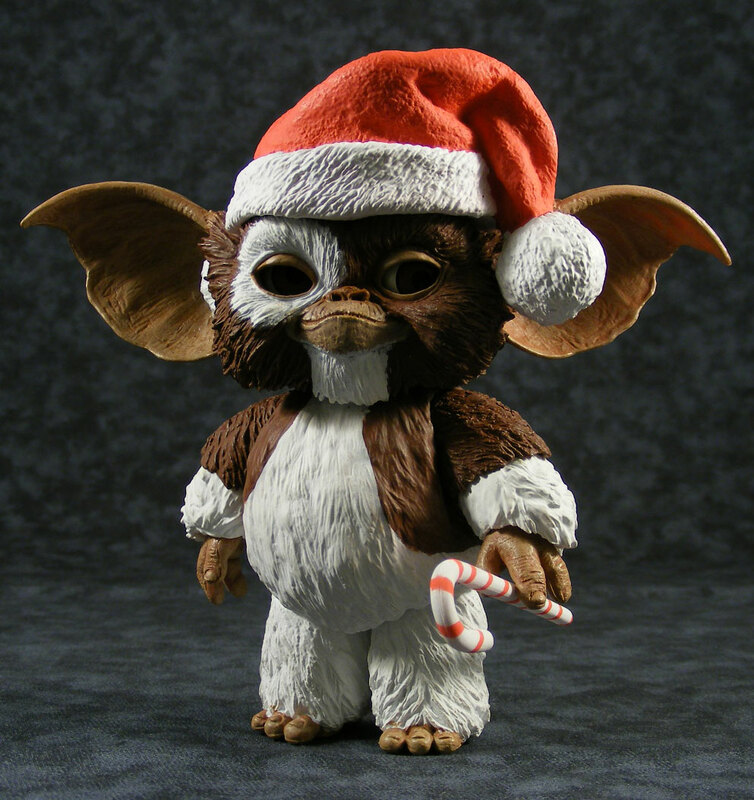 Gizmo comes with two accessories, a horn and a candy cane. They look a bit like the sort of miniature decorations you’d find in a craft store, but they add to the figure’s holiday spirit. He can hold them, though his hands aren’t really made to. The one minor quality control issue I noticed is that the fur on his chin scraped away a little of the brown paint on his upper chest. Overall, this is a cute, well-executed figure and a great holiday exclusive. You can find it at your local Toys”R”Us (or order it from their website). 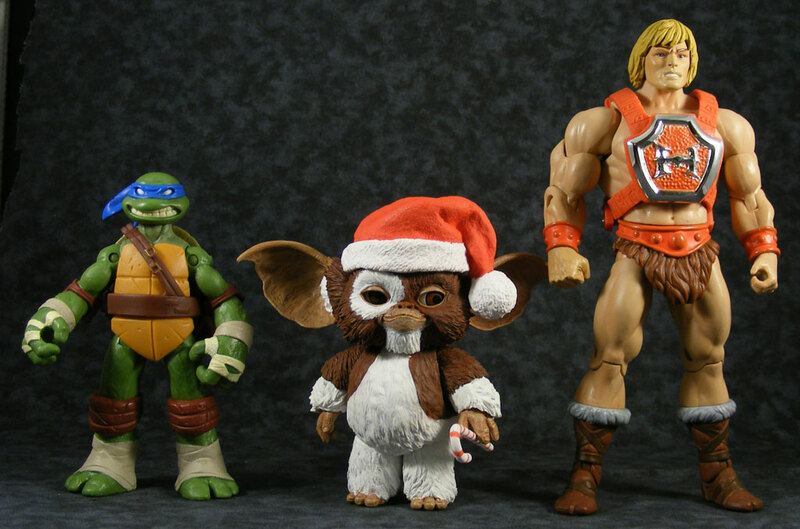 *Seriously, NECA, where is the Bat Gremlin? I've been very interested in NECA stuff of late, and would likely pick this guy up, if it weren't for my local TRU all but eliminating its collector aisle. The next closest store was a disaster area when I was in there a couple weeks ago, and just might've carried Gizmo if I could have found him in the blast zone. When I saw they were open 24 hours until Christmas Eve, I very much wanted to set my alarm and go in there at 3:15am just to see what the hell goes on then. Better judgement prevailed. The TRU I usually visit here in Austin also wiped out the aisle with collector toys — NECA is almost gone — and I wondered how they decided which stores to gut. We're certainly loaded nicely with baby stuff in that location. I forget, which TRU do you frequent? Kingston? I haven't been there for months, I mainly get to Brockton since its close by and right on the way home from work. I know I've seen this guy, just not sure where. I haven't been to Dedham for a while — its about 30 min round trip out of my way, so unless I'm on a hunt I don't pop-in. Kingston is closest and barest, and while certain errands take me by Brockton or Attleboro, they are out of the way but usually more reliable. I had to go to a wedding down in Dartmouth a few years ago and on the way found a TRU that was clean, staffed by friendly folks, and full to the gills with the Ghostbusters Minumates I was then collecting when no other store had any. It was like an oasis, a mirage. Awesome review! I watched Gremlins this Christmas for the first time since I was a kid, and you're right on about the violence and mayhem – I'm surprised this went over my head as a tyke, the film is incredibly dark and really quite vicious. I give it credit for this now – they get away with a lot!! – but am shocked that it didn't scare me much when I was younger. It was a pleasant surprise to see this one when they announced it. 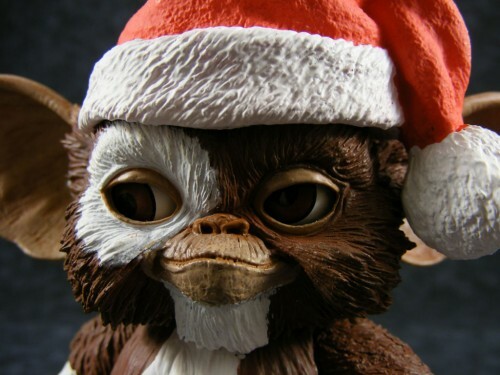 But I'm most excited for the next round of Mogwai. Stripe! And a much improved Gizmo.